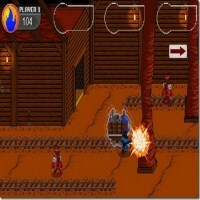 Team Fortress Arcade is a retro side scrolling demake created by Eric Ruth and inspired by the popular online shooter from Valve, Team Fortress 2. Ruth has been known to take big name titles and giving it his own spin. He’s the same guy who created side scroller versions of Halo and Left4Dead and even an 8-bit remake of DJ Hero. This cool sidescroller has been winning raves from fans of the original game as well as those that are just discovering it. Like the original, the developer promises to include an online multiplayer function later on but for now players will have to settle with sharing their keyboard with a friend if they want to play co-op mode. The game features tons of characters in different classes just like the original game. Each character has his own set of skills and specialties that you can take advantage of when bringing him into a firefight. The characters have a primary attack, a secondary one, a melee attack and one air or jumping attack. This gives you plenty of ways to take care of the enemy. If you’re not familiar with the original game, some of the characters at your disposal include a doctor, an engineer, a spy, a scout, a soldier and a couple more. Team Fortress Arcade has 9 levels worth of gameplay and an epic boss battle if you get that far. It’s much like Contra or Double Dragon, where you have up to 4 players invading enemy territory. Although the game doesn’t allow PVP just yet, the bots are fully capable of giving you a good challenge. Even though the game still has a few bugs here and there (full screen option for Mac still has problems,) it’s quite a fun and exciting game to get your hands on. The best part is that you can get all this goodness absolutely free! Definitely worth playing if you ask me.